In Elite Schools' Vast Endowments, Malcolm Gladwell Sees 'Obscene' Inequity In a recent op-ed, law professor Victor Fleischer accused top universities of "hoarding" billions and billions of dollars. And Gladwell, a New Yorker writer, agrees — in much harsher language. 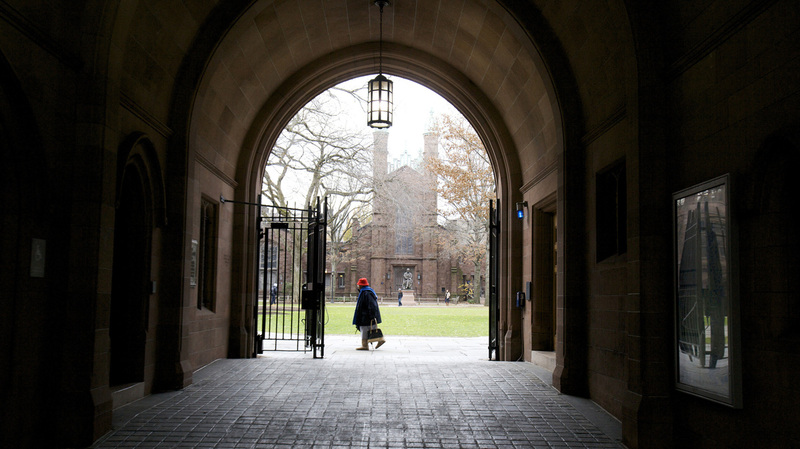 A woman walks through the Old Campus at Yale University. According to a recent op-ed from law professor Victor Fleischer, Yale paid nearly half a billion dollars to private equity managers last year. "As some of these endowments grow larger and larger, the group that benefits the most is not students; it's not faculty. It's the fund managers who manage the money," Fleischer says. "The point is: What is the endowment there to serve? The point is to advance teaching and research and scientific inquiry today." He points to the ways the universities managed their money during the tough financial losses of the financial crisis. "It's striking that, in those circumstances where you would expect the universities to tap into the endowment for a lot of support, they didn't. Instead, the focus was on growing the endowment back to the previous size." Fleischer's argument moved Malcolm Gladwell, the author and New Yorker writer, to fire off a barrage of tweets excoriating Yale and the other schools featured in Fleischer's article. "I've gotten increasingly incensed at the inequality in American higher ed," Gladwell tells NPR's Scott Simon. "There's a handful of schools that just have too much money." Yale supplied NPR with a statement saying their endowment provides $1 billion a year — or fully a third — of Yale's budget, which they say is much greater than the revenue they get from student tuition. And they say that more than half of their students receive financial aid. But that argument doesn't persuade Gladwell, who finds fault not with how the money is spent, but the sheer amount the institution has accumulated. "Do you need $26 billion to provide that level of service?" he says. "Is our educational system better or worse off for having a small number of schools with a massive amount of money, and a very large number of schools who are hurting?" It's absolutely the case that Yale's doing fine. I'm not questioning that at all, and they're able to do great things with their money — you just have to walk through the Yale campus to see what money will buy you, which is a country club, right? Extraordinary facilities. But we have to look at this in the big picture: There are tons and tons of other students at other colleges who are carrying enormous debt loads through their 20s and even into their 30s because school has gotten so expensive. I think they have to stand up and say, at the very least, "We do not deserve to have tax-exempt status for our endowments." It's one thing if a school has an endowment of $500 million that they are stretching a million different ways to meet the needs of its students, to say that as a society, we should allow them to escape taxes so they can spend their money on education. That logic does not hold when you've got $35 billion in the bank, as Harvard does. I think people are free to pay money managers what money managers charge, and money managers are free to do with their money whatever they want. The issue is that all of this circular system is tax-deductible. You and I, and everyone else in America, are subsidizing this activity. I'm happy to subsidize as a taxpayer things that I think are a worthwhile use of my money and things that I think advance the general cause of happiness and social justice in this country. I don't see why I should be subsidizing the $26 billion endowment of Yale so they can afford to spend half a billion dollars each year paying their hedge fund managers. That's the issue: It's our money! Yesterday, I tweeted from a study that was done by this group called Nexus which calculated the per student annual taxpayer contribution for different kinds of educational institutions in this country — so, the value of all of the money taxpayers give institutions. For the typical community college in this country, it comes out to [between $2,000 and] $4,000 per student per year. For a typical state school, it's $10,000 per year. For Harvard, it's $48,000 per year. For Yale, it's $69,000 per student per year. And for Princeton, it's $105,000 per student per year of taxpayer subsidy. That's obscene! That's why I'm upset. that's why I go on these twitterstorms, and that's why people like Victor Fleischer write op-eds! Because there's something wrong with a society that spends 50 times more subsidizing the students at Princeton than it does subsidizing the students of a typical community college. That's wrong.